Two holiday entertaining-inspired recipes: first, a delicious pear and blackberry salad with a homemade creamy poppyseed dressing and second, an easy ham & corn chowder. It’s no secret that I’m obsessed with soups and salads. I’m quite certain I could live on only soups and salads and not be even a little sad about it (as long as I also got the occasional snickerdoodle). Of course the main dishes like turkey, ham or prime rib are amazing, but my plate is always heavily geared towards those sides. So when I got the opportunity to team up with Libby’s® Fruits & Vegetables to bring you not only one holiday side dish but two I was so excited! I truly love these two recipes and I hope they make it onto your holiday tables this year (and for years to come)! 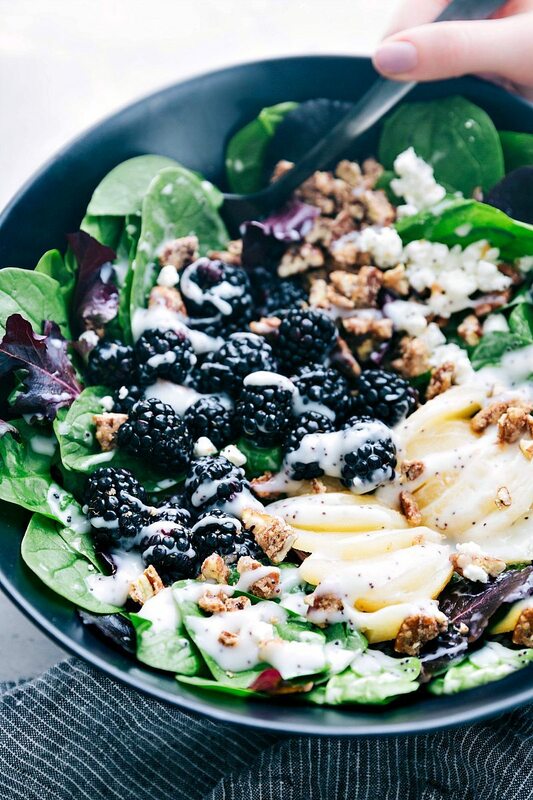 First up, we’ve got a pear and blackberry salad with a simple homemade poppyseed dressing. 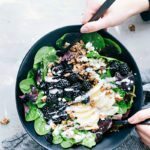 The main ingredients: blackberries, Libby’s Pears, candied pecans, and goat (or feta) cheese, all on a bed of spring lettuce mix. This takes just minutes to throw together in a fancy-looking and great tasting salad. When serving this salad for a party or holiday meal I make a batch of candied pecans and the dressing a day or two in advance. This makes the final assembly take less than 10 minutes. Libby’s Pears are a quick, nutritious, convenient, and affordable ingredient in this salad. 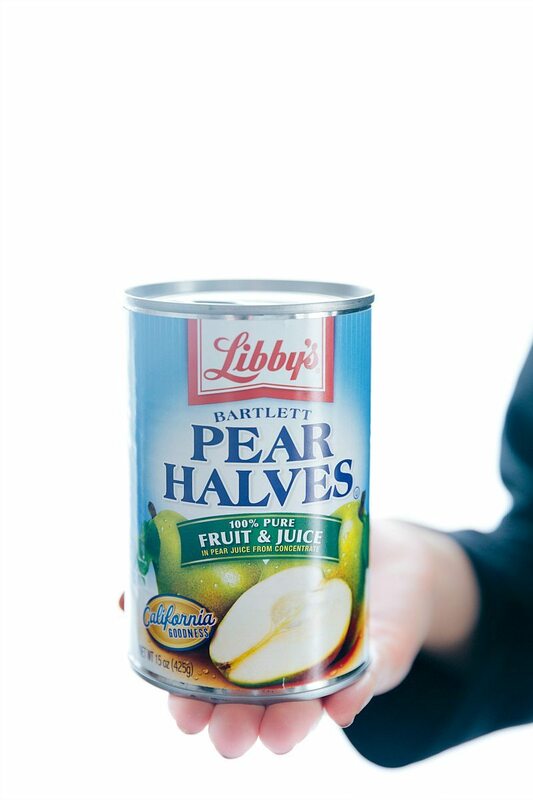 You never know if you can find fresh good and ripe pears at the store so I love removing that stress and getting Libby’s delicious canned pears allowing you to create the perfect holiday salad. 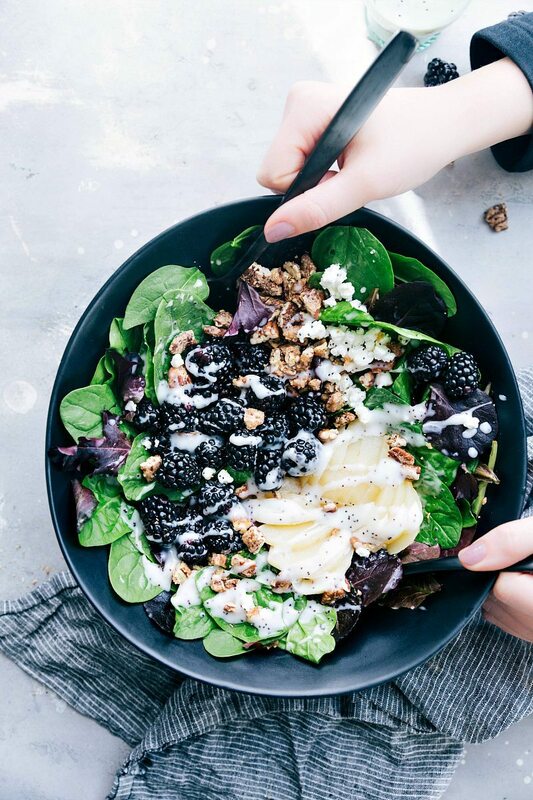 In a large salad bowl toss together the spring lettuce mix and fresh (washed and completely dried) blackberries. Drain the pears and thinly slice. Add to the salad. Right before serving, add the chopped candied pecans, goat or feta cheese, and the dressing. Don't add dressing, pecans, or cheese to any salad you want to have as leftovers. Combine all of the ingredients (add sugar to preference) in a blender and pulse until combined. Store in the fridge until ready to serve. Dressing stays good for 1 week stored in an airtight container in the fridge. Preheat oven to 250 degrees F. Line a large sheet pan with parchment paper and set aside. In a large bowl combine the white sugar, cinnamon, and salt. Stir to combine. In another bowl, whisk the egg whites, vanilla, and water together until frothy. Toss the pecans into this mixture and then remove using a slotted spoon. Put into the sugar mixture and toss pecans until well coated. Spread coated pecans onto a baking sheet. Bake in the preheated oven stirring every 15 minutes until pecans are evenly browned. This takes about 45-60 minutes. Let stand for 30-45 minutes and allow the pecans to fully cool and solidify. Coarsely chop for the salad. Prep/cook time doesn't include the preparation of the candied pecans. 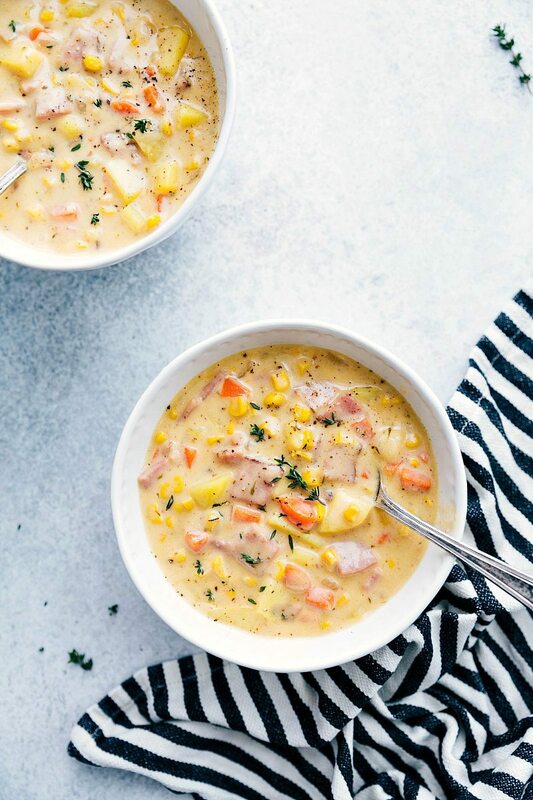 And now onto the Easy Ham and Corn Chowder! My 2-year-old can NOT get enough of this chowder! He calls it “shoup” and he ate two full bowls right after I made it. He’s been begging for “more shoup” all week. This guy definitely shares my same taste buds! I love this chowder not only because it tastes great, but is very quick and simple to make. It’s all done in one pot and it’s the perfect way to use any leftover holiday ham! The soup starts with some onion, garlic, carrots, and celery. Once the veggies are tender you’ll add in the creamy base for this soup which is some chicken stock + milk (you can keep this chowder a bit lighter by using 1% milk). 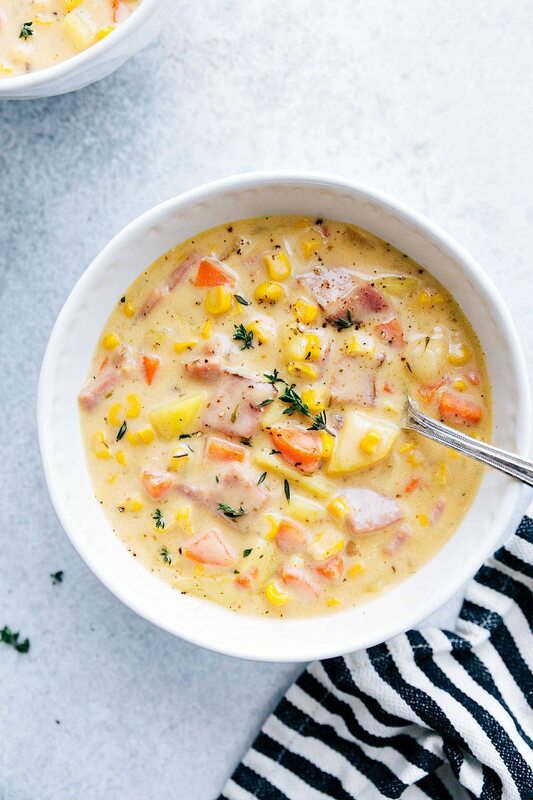 After adding in some chopped-up potatoes, you’ll simmer everything for a bit, then add leftover chopped-up ham, along with the contents of Libby’s Whole Kernel Sweet Corn Vegetable Pouch. Warm that through and it’s ready to enjoy! SO simple and so delicious! 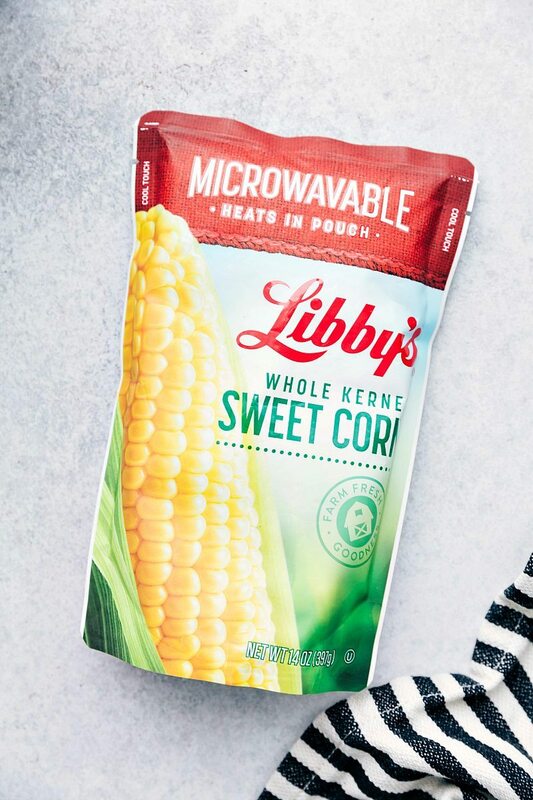 In case you’re wondering what vegetable pouches are, Libby’s is the first in the industry to make them. They stand up straight on their own and fit nicely in kitchen cabinets taking up less space. They are easy to open (no can openers required!) AND you can completely prepare them in the pouch (they can be microwaved and completely cooked through in less than 60 seconds). 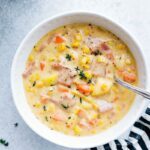 An easy (one pot) creamy ham and corn chowder perfect for holiday entertaining or using up that leftover holiday ham! Add 1/2 tablespoon olive oil to a large dutch oven over high heat. Add in the chopped ham and sauté for 1-2 minutes until lightly browned. Remove from the pan onto a paper towel lined plate. Quickly rinse out the pot and return to the stovetop. Place that dutch oven over medium high heat. Add the remaining 1/2 tablespoon olive oil and once shimmering, add the diced onion, carrot, and celery. Sauté for 4-5 minutes until the onion is translucent. Add in the garlic and stir for another minute. Add the butter and once melted, whisk in the flour. Pour 1 cup of milk in and whisk until it starts to thicken (~1 minute) and then pour the remaining two cups of milk in. Whisk until it thickens (~2-3 minutes) and then add in the chicken stock. Whisk until slightly thickened (another ~1-2 minutes). Bring the soup to a boil, slightly lower the heat and then add the potatoes into the soup. Cook for 8 to 12 minutes whisking pretty regularly. The soup will thicken as it cooks and the potatoes should be fork tender around 10 minutes. (If the soup has thickened too much, feel free to add in additional chicken stock) Add in the dried thyme, dried oregano, ground cayenne pepper if desired, and salt + pepper to taste (I add about 1/2 teaspoon of each). Once the potatoes are fork tender, stir in the drained corn and the ham you set aside earlier. Heat through. Taste for additional seasonings (salt + pepper) and then add in the grated cheddar cheese. Stir until just melted and then taste again for seasonings.